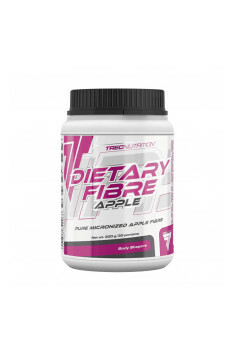 Trec Nutrition Dietary Fibre Apple is a dietary supplement with a high-quality apple fibre. It is an excellent product for all individuals who want to increase easily the amount of dietary fibre in their diet to take care of health every day. The supplement’s fibre has been obtained from selected apple peels subject to a multistage purification and micronisation process. Owing to that, it is characterised by exceptional bioavailability and extremely large active surface. Overweight and obesity are very dangerous to health and may contribute to developing many metabolic diseases, including type 2 diabetes or heart attack. It is thus essential to stay in shape to enjoy good health for years. One of the best solutions is to increase daily fibre intake. Dietary fibre has the ability to swell up in the digestive system and this helps you feel full faster. It reduces the size of meal and thus its calorie value. Specific fibre fractions also react in the digestive tract with fatty acids from food. This may slow down and limit fat absorption, which reduces significantly calorie intake. Diseases of the cardiovascular system are still the most frequent cause of death worldwide. It is thus extremely important to provide it with the best protection. One of the factors contributing to a healthy cardiovascular system is adequate intake of dietary fibre. Scientists have observed that a fibre-rich diet has a beneficial effect on LDL cholesterol by decreasing its blood levels. This mechanism of action consists in inhibiting absorption of fatty acids and bile acids from intestines. Experts emphasise that fibre can also be used to lower blood pressure. All of these mechanisms may significantly reduce the incidence of cardiovascular diseases, in particular atherosclerosis or heart attack. A properly functioning digestive system is one of the bases of healthy life. Dietary fibre serves in this case many valuable functions. Owing to the ability to absorb water and swell up, it controls the passage of food, preventing annoying and exhausting ailments as constipation. It may also have a beneficial effect on colon function which although affects health of the whole body. Some fibre fractions are digested and used by beneficial bacteria residing in this part of the digestive system, thereby limiting the growth of harmful bacteria. Helpful bacterial strains in our intestines have an enormous impact on our health. They produce some vitamins (K), supports the immune system in fighting microorganisms and prevents proliferation of pathogenic bacteria and fungi. The digestion of fibre by bacteria results also in the formation of fatty acids which are used by intestinal wall cells for energy production. It ensures normal functioning of the so-called intestinal barrier which prevents penetration of different toxic substances into the body. Our daily diet is often rich in simple sugars whose excess is the basic factor for developing type 2 diabetes. By filling the digestive tract, fibre slows down glucose absorption, consequently preventing its sudden increase in the blood. Normal blood glucose concentration significantly reduces the incidence of diabetes and helps treat this disease. It may also decrease the likelihood of complications that are dangerous to health. There are many reports about a positive role of fibre in cancer prevention. Many researches have observed a decreased risk of developing colon and also breast cancer in individuals on a fibre-rich diet. In the case of the first cancer, the mechanism of action consists in protecting cells of colon walls and improving the excretion of toxic substances in stool. In terms of breast cancer, fibre is believed to show its anticancer action by the ability to remove excess of oestrogen. To sum up, Dietary Fibre Apple is a dietary supplement with a very broad spectrum of action. It is recommended to all individuals taking care of their health. However, it is especially indicated for those willing to lose excess weight and suffering from digestive disorders. Owing to a unique technological process, it is characterised by very high bioavailability. Dissolve a single dose of the preparation – 10 g (1 tablespoon) in 300 ml of water or juice. Depending on the needs, use 1-2 portions a day, 30 minutes before a meal. The daily fibre intake should vary from 25-35 g. It is recommended to take one tablespoon (10 g) of the supplement 1-2 times daily 30 minutes before a meal. Too much fibre can cause constipation or other digestive disorders as nausea, stomach ache or flatulence. It is necessary to drink a lot of fluids (2-3 litres daily). Apple fibre extracted from the skins of apples, it is a source of pectin (soluble fibre fraction). It is not digested in the digestive tract due to the immunity to enzymes. Maintains normal levels of LDL cholesterol, also it has the ability of its reduction and reduces the absorption of bad cholesterol from the digestive tract. This way it reduces the risk of atherosclerosis. It is very useful for weight loss, because it significantly reduces the appetite and hunger, allowing for the reduction of body fat. It affects the intestinal peristalsis acting anti-toxic thanks to the ability binding chemical compounds with heavy metals or intestinal bacteria. It is a part of dietary supplements supporting reduction of body fat and nutrient supplements.